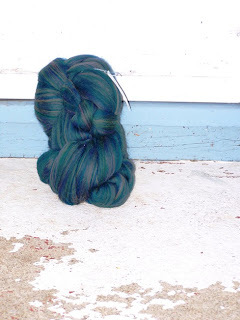 Prior to, and following the tree excitement*, I have been spinning. Quite a lot actually. 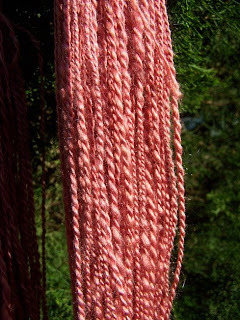 The yarn I refer to in the title is this. 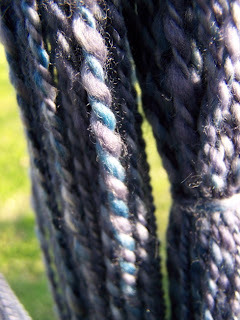 A three-ply merino wool that is about light worsted weight. The pictures are not great. They do not give a true sense of the subtle color variation. 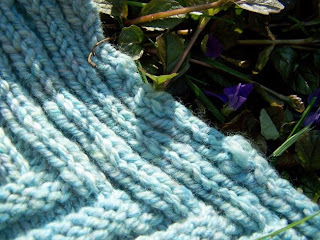 They do not allow you to feel how soft the yarn is, how springy, how wonderful. As soon as I washed it and the yarn was dried, I had to start making something with it. It knits up nicely. After much exploring on Ravelry and flipping through books and magazines, I remembered a scarf from the Vogue Knitting On the Go: Scarves book I have had for years. That one was made with sock yarn, but it was not hard to adapt. 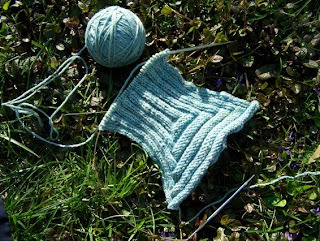 Here is the end of the scarf early in its development. The scarf is much longer now, and I hope to finish it this weekend. Once I started spinning again, I have not stopped. 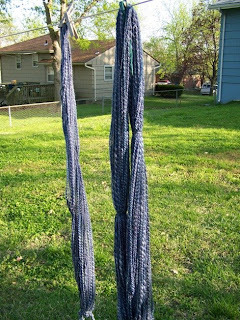 I created this bulky weight 2-ply from a dark blue merino top. 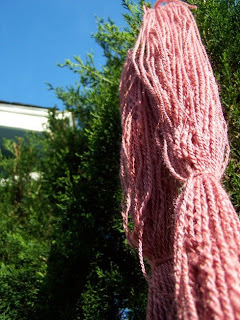 My goal here was to spin a consistently soft and bulky yarn. I think I have the soft down, but I do need to work on my consistency. I think this yarn will become a hat. Then I moved on to some silk. This was dyed by my Plant Biology class this semester using brazilwood. 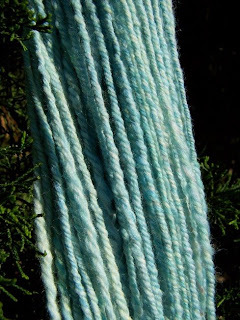 The silk is about a light worsted-weight. I am not crazy about the color, and I am not sure what it will become. The joy I got from spinning resulted in me buying some new top from Yarn Barn. 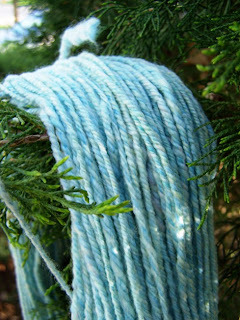 This is a teal colored merino wool, the same brand as the sky blue yarn was made from. I love that the colors in the top are vertical. 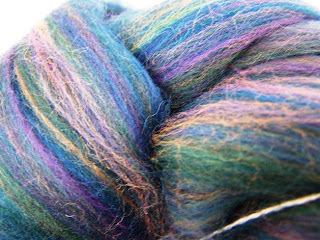 Here is a close-up of the color variation in the top. I am trying to be very consistent and spin a 2-ply sock yarn. I want to make a pair of knee-high socks from this yarn, specifically Nancy Bush's Highland Schottische Kilt Hose from her Folk Knits book. I have about one bobbin of the singles spun up. I am very excited about this project. So, off to spinning for a few minutes before I have to leave for a meeting at school.